← Where’s your helmet, mom? The things that I write about on the blog are only a portion of what’s really happening. This is a problem inherent to life, I think: you get so busy living that there is only so much time to talk about it all. This can lead to some false perceptions. One that’s come up lately, I’ve realized, is the sense that the Bullitt spends a lot of time in the shop. That’s not really true. It’s just that the times it goes to the shop it really ticks me off. After almost a year the Bullitt has been impressively reliable, with only a couple of exceptions that are, frankly, the result of our ignorance. The first exception relates to the gearing. I have an aversion to pinning up my pants to keep them from getting caught in the chain, although I’m getting over it. The standard setup on a Bullitt is a triple front ring, which is great for hauling up hills, but as many riders already know, is basically incompatible with a chain guard. So when we bought the Bullitt, we put an internally geared front hub on it, the FSA Metropolis Patterson crankset. The Metropolis is unquestionably cool, and you won’t need to roll up your pants. Unfortunately, it is not built to withstand the kinds of loads and riding we do. It is very sensitive to people doing things, like, say, pedaling over a speed bump and smashing unexpectedly into a hidden pothole on the far side, or to a rider shifting down after hitting a quicker-than-expected red light with a fully loaded cargo bike and then pushing off on a steep uphill from a dead stop. 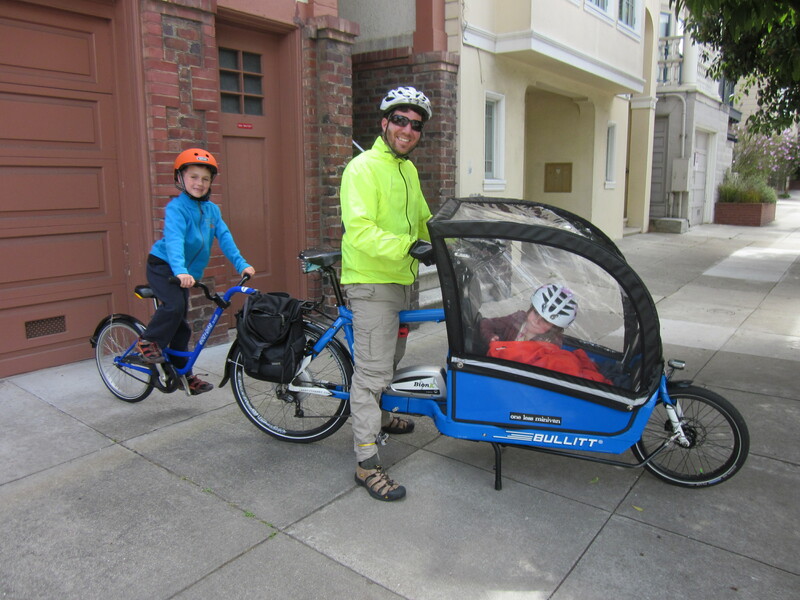 These are not what I would call conventional bicycle riding situations, unless of course you are a family living on a steep hill in San Francisco, in which case they’re like daily rituals. So we broke the Metropolis. Twice. After the second time, we replaced it with a triple front ring, which withstands anything we throw at it (and if it didn’t would be cheap and quick to fix anyway). That wasn’t particularly expensive, but it was very time-consuming. I miss the Metropolis, because it shifted like a dream when it wasn’t broken and had a lot of range, but it was not to be. In the meantime, I’ve learned to embrace skinny pants. Sure, they may not be the most flattering look, but they don’t catch in bike chains and they are wonderful at compressing a broken leg that tends to swell up at the end of the day. Although maybe that’s just me. The second exception came up pretty recently. The Bullitt went back to the shop for another time-consuming repair when we broke over a dozen spokes at once on the rear (BionX) wheel. This turns out to be a BionX and San Francisco-related thing (San Francisco is hard on bikes). The first time we didn’t realize what the issue was so we had the bike shop replace the spokes and re-true the rear wheel. The folks at The New Wheel were the ones who warned us that it would happen again unless we put a stronger rim and spokes on that rear wheel. One week later, we learned how right they were when three of the new spokes popped. That’s a lesson to all of us, yes? Go to the pros with your electric assist bike! So we took the Bullitt back to the shop and now we have a thicker rim and spokes and they are hanging in without incident. This was pretty cheap, but once again, time-consuming. There have been other odds and ends, but they don’t affect our ability to ride the bike. Matt dropped the BionX controller and destroyed its display, which now looks like something out of a slasher film. It still works, though. One of the fiberglass poles holding the rain cover has split twice—the first time probably due to the combination of wind sheer and the kids messing with it, and the second time due to some drunk baseball fans snapping it in two. Splendid told us how to order spare fiberglass poles, which are now sitting in the garage for the next time it happens. I think they cost $15. If you happen to have obnoxious sports fans roaming your neighborhood, you too may want some spare poles. The two big repairs represented several weeks in the shop taken together, and those messed with our lives. The Bullitt has become what our car used to be, and we use it almost every day. I wrote about those incidents because they were such an unpleasant shock—with the Bullitt our lives are pretty easy and without it they start to derail. But it did not fail it when we needed it most. All last summer while I was bed-bound for 23 hours a day, Matt used it to carry both kids to school and preschool and summer camp. At the time, our daughter was still attending preschool on the top of Mt. Sutro, and our son’s summer camp was up one of the toughest hills we have ever had occasion to ride regularly (9th Avenue from Irving to Ortega, for locals reading along). And although there were days that we needed to call in friends for a carpool or a family member to walk someone home, mostly Matt managed all of that extremely grim summer solo. So how can I hold a crankset and some broken spokes against the Bullitt? Especially when I know they won’t happen again? Also, Matt is awesome. We started this year knowing that there was trouble in the wind. The university decided to kick everyone out of faculty housing, our daughter’s preschool, disastrously, was taken over by a for-profit corporation, and the campus where I work was scheduled for closure with everyone on site told we would move “somewhere.” As bad as all of that was, we could not have predicted how much worse it would get when I was run down by a distracted driver in April. For a week we assumed that our car-free days were over. But with my right leg shattered it turned out that I couldn’t drive either, so here we are. 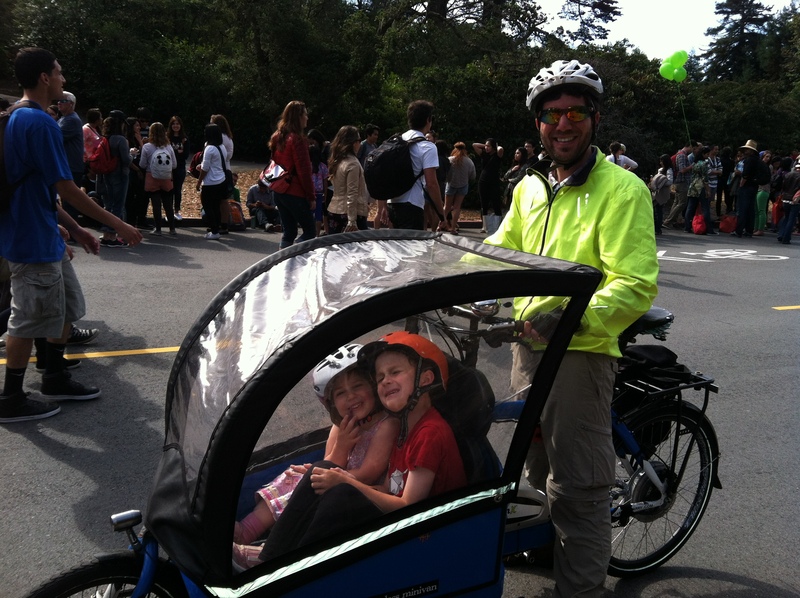 I’m riding again and the Bullitt is still hauling the kids. I can’t yet do everything that I used to do, but the bus and rideshare make up the difference. And in other ways, we seem to have turned the corner. 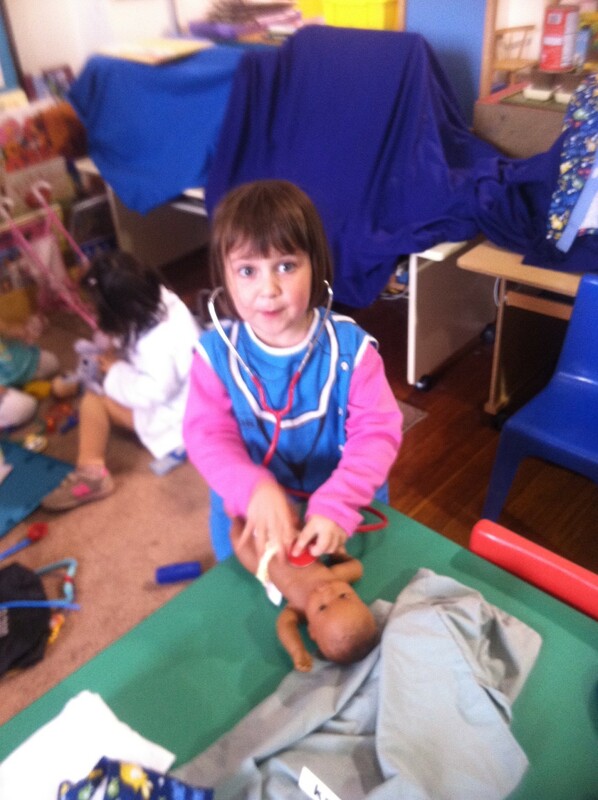 In July our daughter started at a new preschool, a Japanese immersion program that is a feeder for Rosa Parks. She loves it so much we have to drag her home every evening. The office move keeps getting postponed another couple of years into the future. University housing can’t kick us out as long as I’m disabled, but we have other progress on that front as well. I am walking again, and people tell me my cane looks badass. We’ve been taking long weekends with the kids to try to make up for their having such a bummer of a summer–the other week we camped in a (handicapped accessible) yurt, and we’re headed to the coast this weekend. It’s been one hell of a year, and it’s not over yet. But life is a little easier with a reliable bike. Glad you are walking and biking and vacationing and… well everything. Thanks! The cane is matte black and collapsible. I think its badassity is more of a relative thing. Good to know about the Metropolis. Did they explain what the issue is with the broken spokes. Were they just undersized for heavy loads and potholes? I’m really not sure about the exact issue–I’d have to refer you to The New Wheel for a real answer. I guess with a bionix wheel a dual drive wouldn’t work, but if you have a bike without electric assist or a mid drive it might be an option. 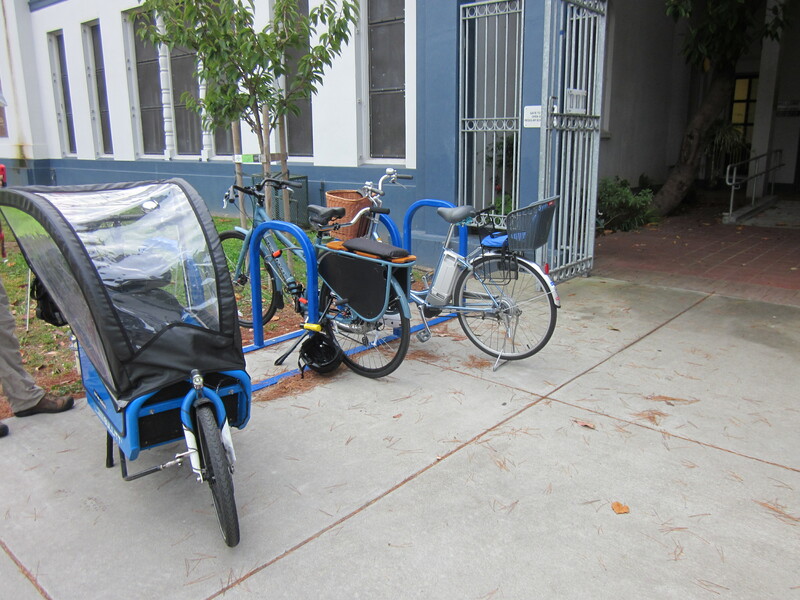 I have one on the Bike Friday tandem I use to pick up my son after school, and they are quite easy to adjust. Lose the big ring, put a bash ring on, voila – bell bottoms. Skinny jeans really are the most practical choice. In addition to being stylish. That is good to know! You’ve inspired me to try to be a little more stylish. I recently bought colored pants for the first time since high school (green skinny jeans). Today I am even wearing a belt and a necklace. This is major-league progress from my former all-black and accessory-free wardrobe.